View of face of the Raven stone, Tyrie. 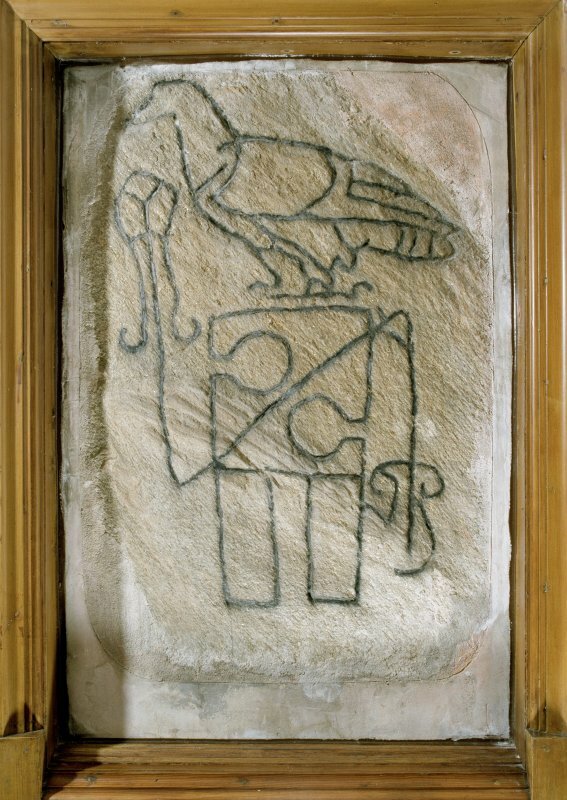 The Raven Stone, Pictish symbol stone. Digital copy of E 56711 CN. View of symbol stone. Reproduced, masked, in Allen and Anderson 1903, Early Christian Monuments of Scotland, fig.204. Tyrie symbol stone. From J Stuart, The Sculptured Stones of Scotland, vol. i, 1856, plate xiii. Present location: built into an inside wall of the parish church at Tyrie. Evidence for discovery: found in or just before 1800 in the foundations of the old parish church, the precise location of which is uncertain, but presumably within the kirkyard (the new church was built in 1800). It was placed first in the porch of the new church, removed in the 1890s when it was photographed, and subsequently built into an interior wall of the church. Present condition: the photograph used in ECMS shows damage to the top right and base of the stone, and the incised lines are painted in black. 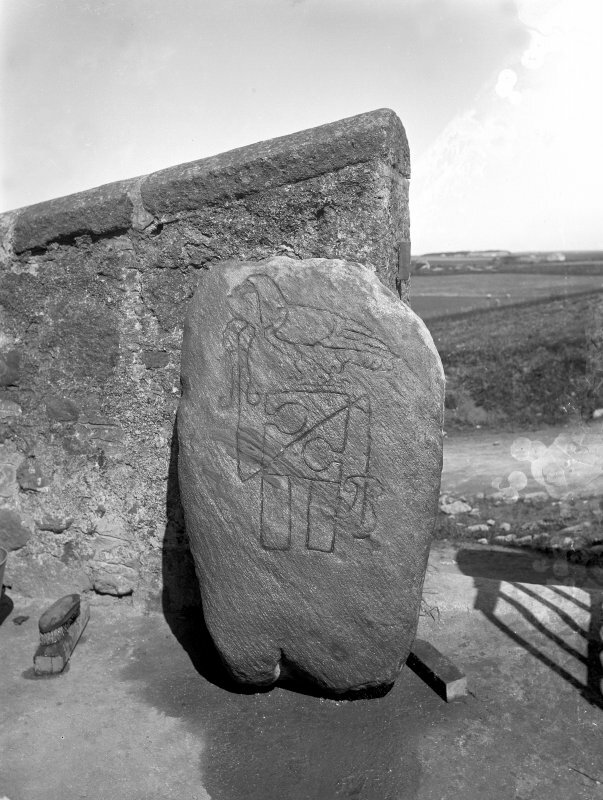 One broad face of this slab is incised with two Pictish symbols: an eagle facing left and almost standing on the top of a notched rectangle with Z-rod. References: ECMS pt 3, 187-8; Fraser 2008, no 49. See also NJ96SW 9 and NJ96SW 17. A slab of blue mica-schist bearing Pictish symbols was recovered from the foundation of the NE corner of the old parish church (NJ96SW 9) and now stands within the porch of the new church at NJ 9300 6310. NSA 1845; A Groome 1901; J R Allen and J Anderson 1903. 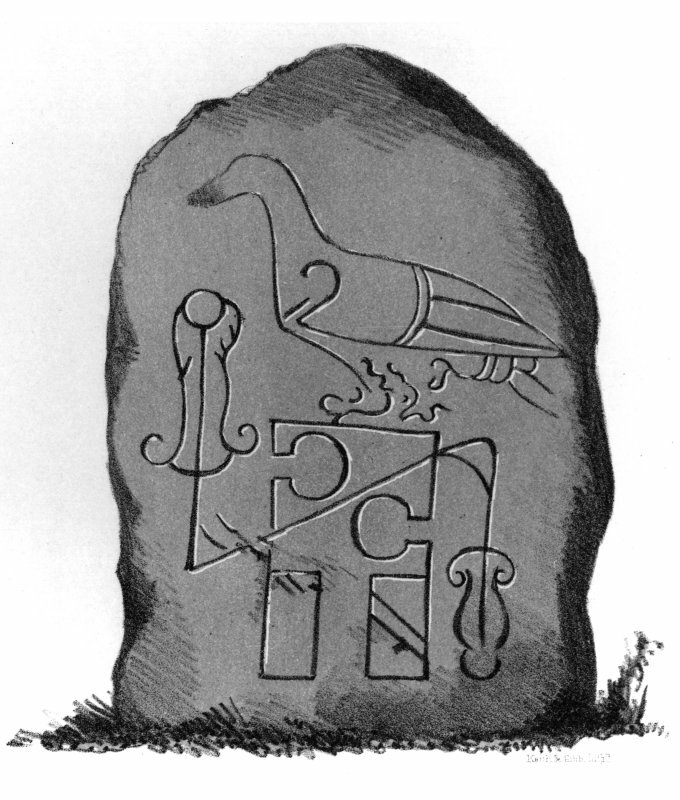 A Pictish symbol stone, named Raven Stone, as described and illustrated by Allen. Visited by OS (NKB), 8 March 1967. 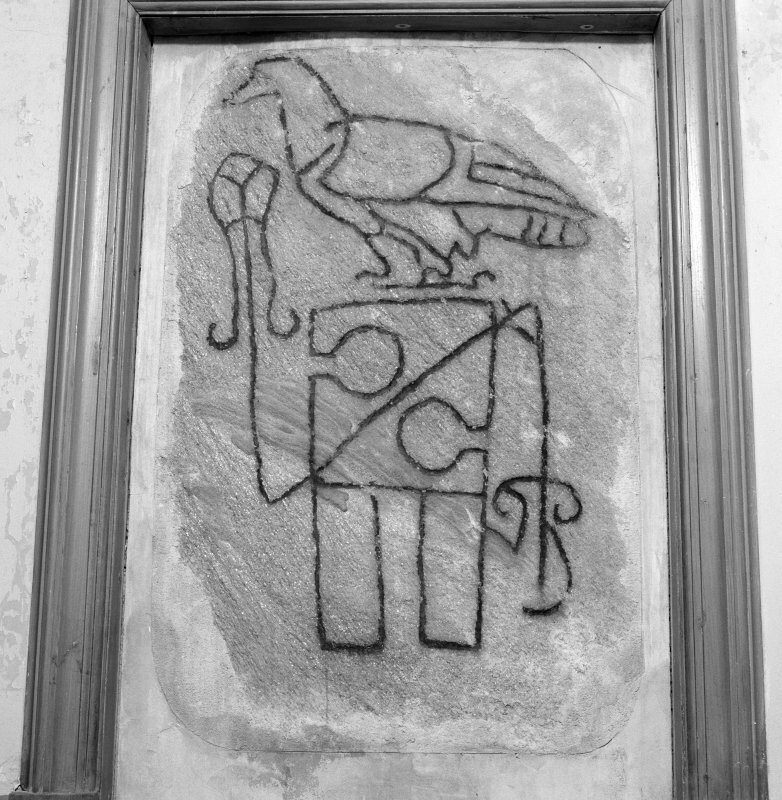 This stone is built into an inside wall of the church, adjacent to the vestry; the symbols have been blacked-in. Descheduled: former index number 87. Information from Historic Scotland, 23 December 1996. 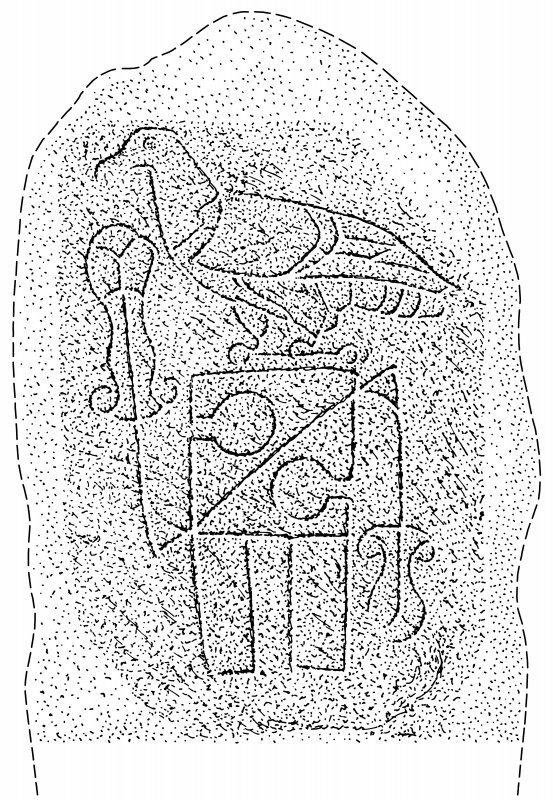 Class I symbol stone - the Raven Stone - showing an eagle over a divided rectangle.